NASHVILLE – The Metropolitan Nashville Airport Authority (MNAA) Board of Commissioners at the July board meeting awarded Messer Construction Co. the terminal parking garage and airport administrative office building project. 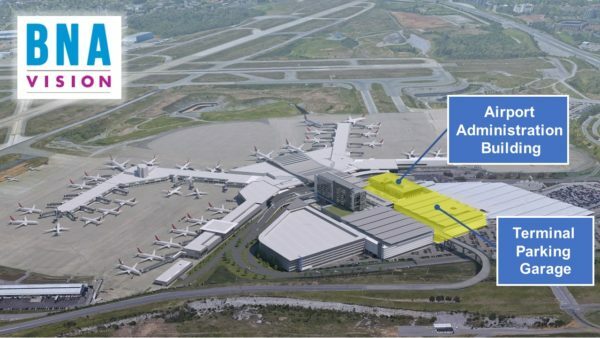 The $144 million design-build contract is part of BNA Vision, the Airport Authority’s dynamic growth and expansion plan for Nashville International Airport (BNA). The project includes a six-level parking garage with approximately 3,000 spaces, a large pedestrian plaza and 64,000-square-foot airport administrative office building on the fifth level. The new parking garage will occupy part of the footprint of the existing Short Term Parking Garage, which will be demolished later this year. The administrative office building will replace the Airport Authority’s current office space in the terminal, as well as providing space for the Transportation Security Administration (TSA) and other airport services. Other BNA Vision projects currently underway include the airport’s new Parking and Transportation Center, set to open in late 2018; the terminal apron and taxilane expansion project, which will be completed in two phases with the first finished in summer 2019; and the Concourse D and terminal wings expansion, set to open in summer 2020.